With its harbour and an abundance of red clay to the north of the town, Poole in Dorset had long been a centre for pottery making ever since a builder's merchant and ironmonger, Jesse Carter, bought a run-down tile manufacturing company on the quayside in 1873. 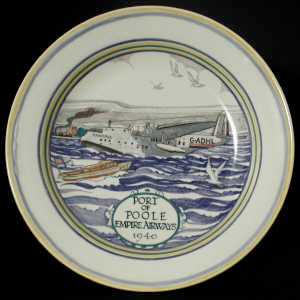 However, the Poole Pottery, as it became known, is now remembered as the maker of instantly recognisable Art Deco ware and the striking wares of the 1960s which marked it among the most innovative of British post-War industrial potteries. Now based predominantly in Staffordshire, Poole Pottery production continues today. Established in 1873, the Carter Company was primarily concerned with the manufacture of tiling and architectural products. 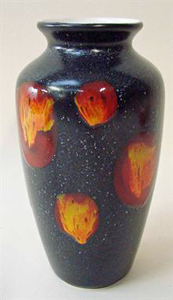 It was Jesse Carter's son Owen who developed the art pottery. By the end of the First World War this was making a wide range of decorative wares under design head James Radley Young and had established important links with the Omega Workshops. 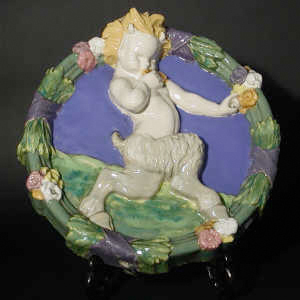 Two years after Owen Carter died, his brother Charles formed the partnership with the designer and silversmith Harold Stabler and the Stoke-on-Trent potter John Adams in 1921 that ushered in Poole's heyday. 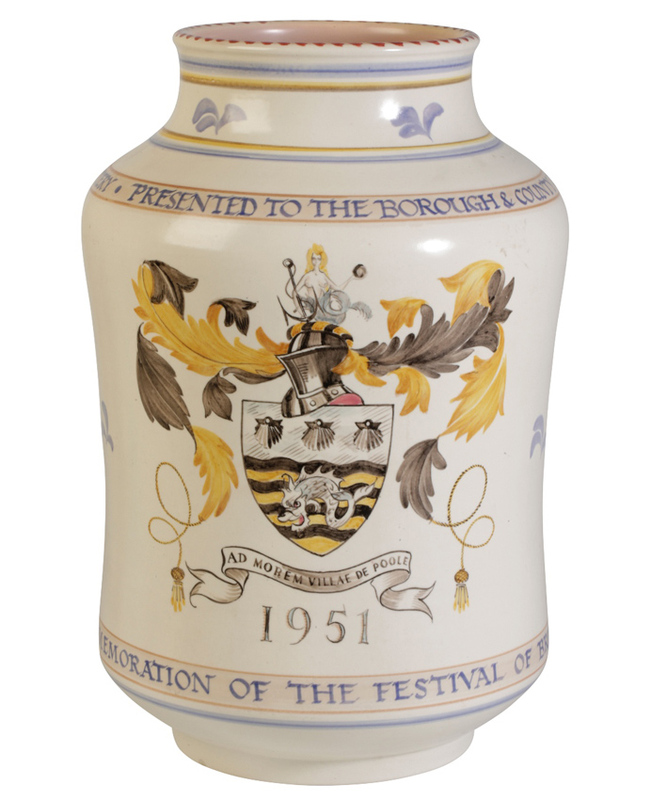 It was during the Carter, Stabler and Adams period that some of the most memorable Poole wares were produced. Much of the traditional range was based on the work of the chief designer in the 1920s, Truda Carter. These red earthenwares, covered in a white slip and then dipped in a semi-matt clear glaze before decoration in a variety of floral and geometric patterns, drew high acclaim at the time and were retailed through leading stores, including Liberty's and Heals in London. 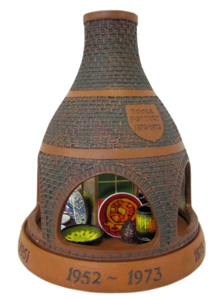 The Second World War caused a complete rethink at many of Britain's potteries. Wartime restrictions had left staff numbers reduced, buildings and machinery were in a poor state of repair and there was little appetite for repeating pre-War designs. At the Poole Pottery this meant investment in a new kiln and an influx of new talent to complement some of the old guard. Poole first exhibited their Contemporary wares in London in 1953, two years after the Festival of Britain. Heavily influenced by Scandinavian design and associated developments in science, they combine the talents of master potter Guy Sydenham, who had worked at Poole since 1931, and Alfred Read, an established industrial designer who became head of the so-called Design Unit in 1951. 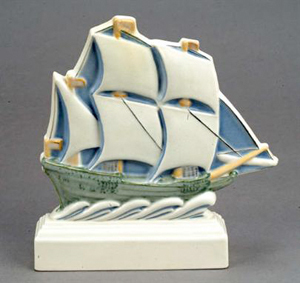 The following decades reinforced Poole's reputation as a business that could bridge the gulf between studio pottery and mass production. 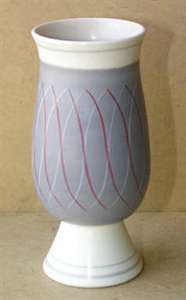 Delphis, Aegean, Ionian and Atlantis - all are trademarks given to wares from the 1960s and 1970s that came under the umbrella of Poole's Craft Section that gathered momentum with the influx of art students who were encouraged to make their own individual statements on what were otherwise standardised shapes. The most talented of these was Tony Morris, a student at Newport School of Art, who joined Poole in 1963. 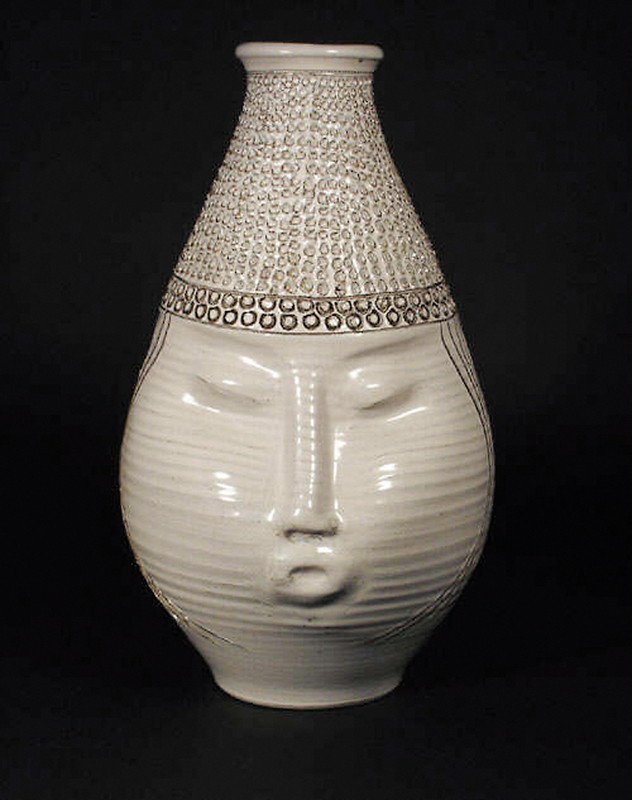 These Studio wares that married a new range of contemporary shapes decorated with largely abstract patterns and experimental glazes, are among the most avant garde works to emerge from a commercial pottery. The subject of a management buyout in 1992, the company went into administration in 2006 - having already sold the museum collection at Christie's South Kensington. Now under the control of Group Ltd, which also owns Royal Stafford Pottery, a pottery shop remains open on Poole Quay with a studio on site where one-off pieces are produced. However, most production is now based at Burslem, Stoke. The most popular current line is Living Glaze. The Poole range is vast and fleamarket finds can still be made for a few pounds. The distinctive Twintone dinner and tea services (made right up until 1981) or the post-War floral decorated wares, for example, remain very affordable. 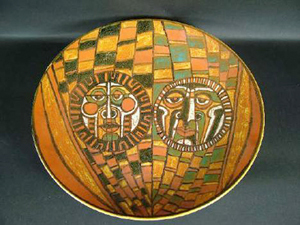 The Art Deco wares produced in the 1920s and 30s heyday are traditionally the most sought after. Designs are typically identified by the two-letter code that appears to the base alongside the initials of the artist. The standard reference works are a great source of information on both of these. 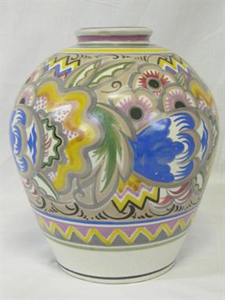 Prices were at their peak in the early 1990s when Cottees, the Dorset auctioneers who, for more than a decade, have held biannual sales dedicated to Poole pottery, sold a massive 14in (36cm) pot decorated in the striking DK pattern by Margaret Holder who worked in Dorset 1927-41, for £17,000. When Christie's South Kensington sold the contents of the Poole factory museum in March 2004, a number of Art Deco wares sold for more than £5000. Poole Town Council, a welcome contributor to the market for several years, was among the major buyers at the sale spending £88,000. But collecting taste is changing. 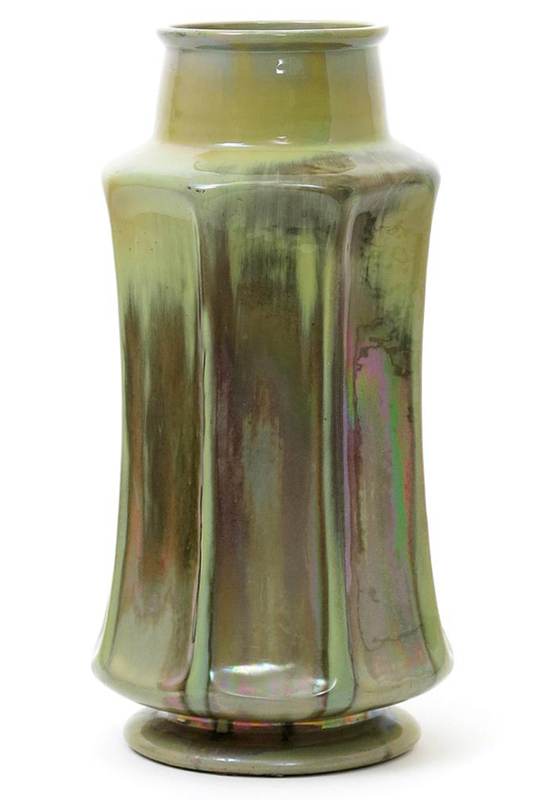 CSA's Deco wares still command substantial sums but prices have fallen away. As a number of key buyers leave the market, it is a good piece that now brings four figures at auction. The classic retro Contemporary and associated Freeform slip cast wares with their Festival of Britain styling were ground breaking in British industrial ceramics design but they will not break the bank. In fact, after some substantial price hikes a decade ago they have stabilised at affordable levels. Expect to pay £30-300. The designs of the 60s and 70s were a complete departure from anything that had gone before. These patterns in their palette of bright oranges, greens, yellows and reds defined the look of the 60s and, as with most extreme fashions, they were to become passé. Hidden or discarded in the following decades, a revival of interest in the 90s saw prices rocket. Atlantis was the name given to a range of cutting edge vessels made by Guy Sydenham between 1972 and 1977 in the twilight of his career at Poole. Gouged, carved, encrusted, incised and fashioned from stoneware or earthenware, these celebrated red clay in its 'natural' state. Lamps are among the most eagerly collected of Sydenham's often wacky and witty Atlantis output (smaller utilitarian pieces are less reliable) and prices over £1000 are commonplace. Tony Morris still works from his own studio - his non-Poole chargers command sums between £300 and £500 each - but it is his highly imaginative work from the 1960s that is so avidly sought among the younger breed of Poole collectors. 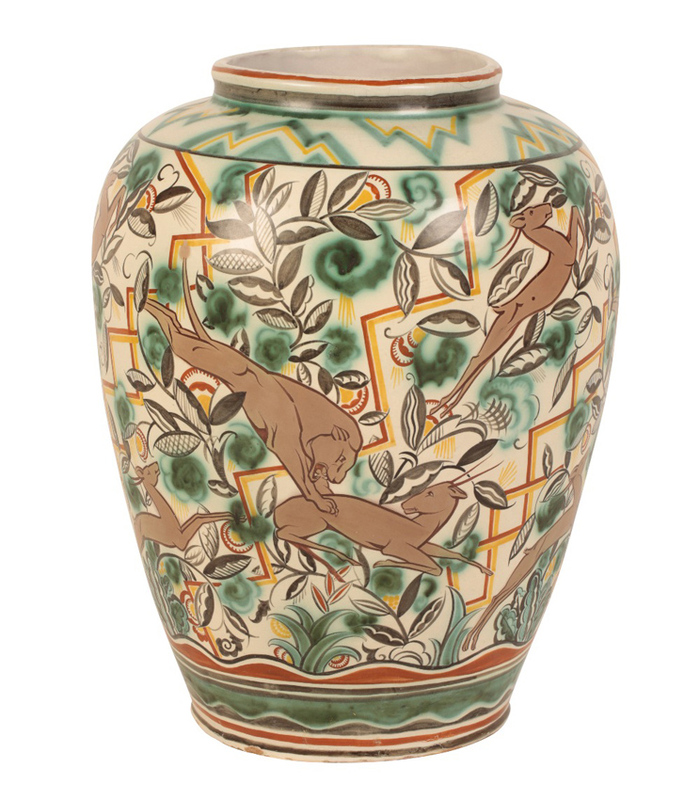 When prices began to fall for Poole's floral-decorated earthenware of the 1920s and 30s, prices for Morris chargers accelerated. A 16in (41cm) diameter example depicting a signature design for the artist - sunbursts and sunspots - and dating from c.1963-64 established an auction high for a piece of post-War Poole when it sold at London auctioneers Rosebery's in 2005 for £5200. Prices for prime-period Morris start at around £500. 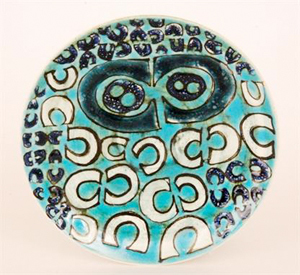 This Poole Pottery shallow charger by Tony Morris, 10.75in (27.5cm) in diameter, is decorated in green and blue tones, the impressed mark and monogram helping to identify it. Estimated at £400-600 Fieldings in Stourbridge at a sale in March 2018, it was knocked down at £1200. 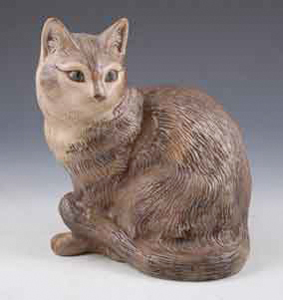 Other popular ranges from the post-War era include the 1970s naturalistic stoneware models of birds and animals by Barbara Linley. Her fieldmice groups are common and bring only a few pounds but rarer breeds (such as the Canada goose or the kookaburra) can command substantial sums. 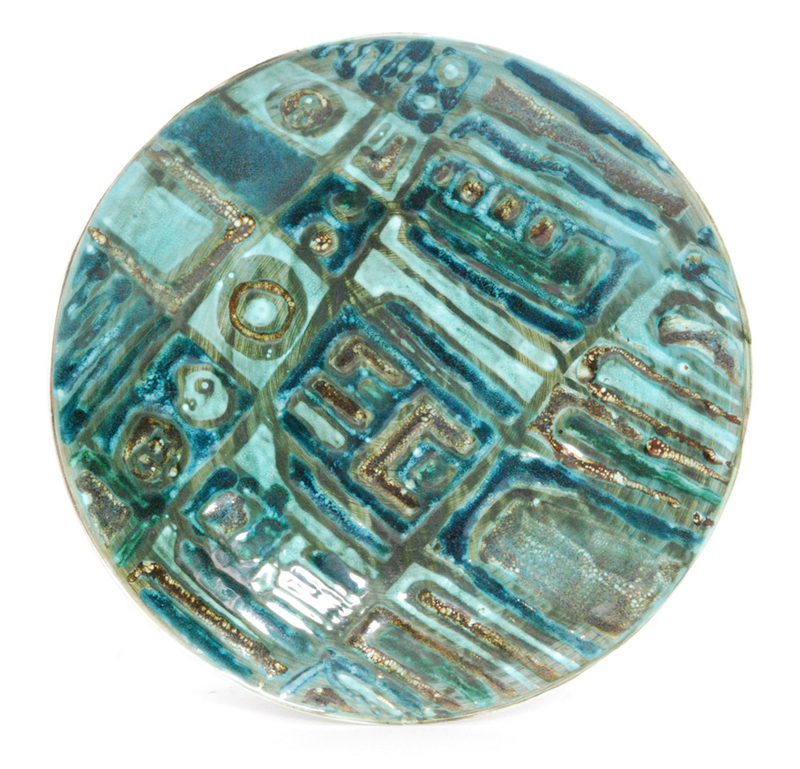 Will Poole prices rise as kilns cool?